Ever since the Atlanta Braves announced their new move to Cobb County from their 50 year old home inside the perimeter, I’ve been asked about the real estate impact for the surrounding area and Cobb at large. I’m a sports purist, and I’m one for tradition so this move makes me a little melancholy. However, I do think there’s plenty of good here, especially if you are a Cobb resident or aspire to be one. That good will come to a county that already gets it right with their senior tax discounts and stellar school system. If you build it, they will come. Field of Dreams got that right! Anytime you get a Major League Baseball team you can expect a nice economic boom in return, and I’m not buying that traffic is going to keep people away from the stadium. Look, if you live in Atlanta, you deal with traffic. 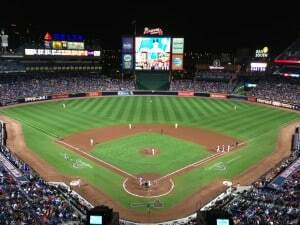 It’s not like driving to Turner Field is a walk in the park, especially coming from the north side of the city. The interstates are already awash with construction surrounding the stadium. It’s going to be a little painful in the interim, but I expect it to be no worse than what we are accustomed to. Retail and multi family developments are flocking to the area hoping to cash in on the impending wave of interest. We’ll see Cobb increase in population due to the new jobs created in that area, which is now estimated at 5,000 jobs physically at the stadium and another 3,000 surrounding the stadium. 8,000 new jobs in Cobb. That’s moving the needle! Right now the word on the street is that the $250M+ that Cobb County is pumping into the new stadium construction will NOT raise property taxes for area residents, and that’s beautiful music to those who may be against the Braves’ move. The increased revenue should mean improved infrastructure and services at a minimum. Cobb is super smart to make an investment like this because if history is any indicator, they should have the Braves for at least 20 years, if not another 50. The economic impact is astronomical. If I were a betting man, the first area that I’d bet on as a result of the Braves move is Smyrna. While always viewed as a convenient and affordable option for suburban living yet close to the city, it has the most to gain considering it’s at the front door of the new stadium and all the goodness going on around it. Smyrna properties have rapidly increased in value, and I expect that trend to continue as more and more money is pumped into the area. The second spot that I believe has the most to gain is the city of Sandy Springs. While there’s plenty of luxury property in Sandy Springs already, the tear down/rebuild trend will explode as buyers search for larger estate sized lots in this incorporated super city within a city. We’re seeing this emerging trend already, and it will continue to rival the Buckhead area within Atlanta’s coveted clutches. While the Braves might not win any urban renewal awards, Cobb County is poised to capitalize on this move and just became known for something besides great schools and senior tax credits. They are now home of the Braves! The Peters Company is experienced in all areas of Cobb County and beyond. If you want to make a move like the Braves, give us a call today at 404-419-3619. ← Just Listed :: An Entertainer's Dream in Midtown!